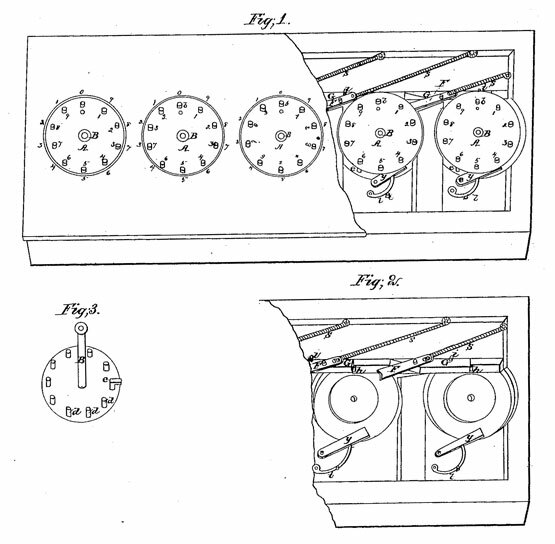 In 1859 the young carpenter from Rockville, Indiana, John Campbell, patented a 5-positional adding device (called Addition Machine), similar to these of the French Jean Lépine and Hillerin de Boistissandeau from 1720s. 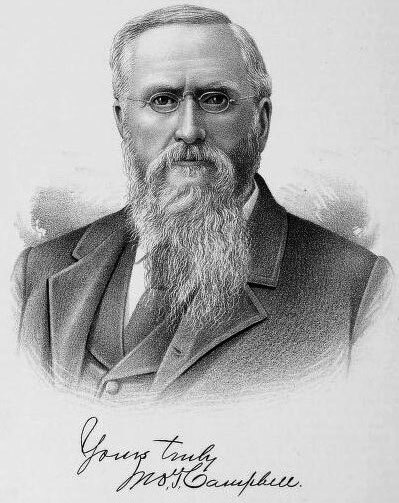 John Tenbrook Campbell was born on 21 May 1833, in a farm near Montezuma, Parke County, Indiana, to Joseph Campbell (11 May 1808–22 Jan. 1841) and Rachel Tinbrook Campbell (19 June 1814–5 Jan. 1844). Joseph and Rachel married on 27 March, 1832, in Parke County, and John Tenbrook was their first child. Campbells were descendants of a prominent Scottish Clan (do you remember Robert "Rob Roy" McGregor Campbell, the titular hero of Walter Scott's novel? ), many members of which emigrated to the New World in 17th and 18th centuries. John was the first of seven children and spent his boyhood days in his father's mills (Rockport Mills). He had a hard time after the early death of his parents, and at 15 he left home, took part in the building of Wabash and Erie Canal, then secured employment on a farm, where he remained until he reached 17. Later on he began as a carpenter, also studying at Annapolis and Western Manual Labor School. For 10 ensuing years he worked at his trade of a carpenter during the summer and followed the profession of a teacher in the winter season, meantime spending another term at the Labor School. Finally he graduated as a civil engineer. It was during this period, when he patented his adding instrument (US patent 24990), shown in the picture bellow. 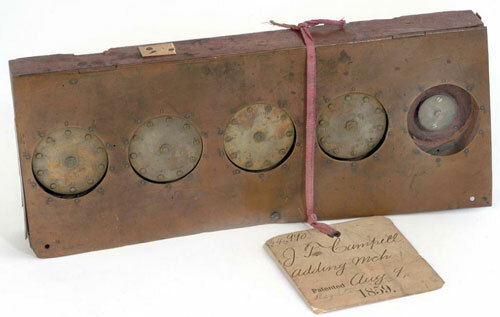 It was a simple adding device, which internal mechanism is rather similar to the devices of Lépine and Boistissandeau, although Campbell most probably was not aware of the above-mentioned and had devised the mechanism himself. It seems the device of Campbell never went into production, and only the patent model (see the lower photo) survived to our time. The device is a simple finger-operated adding machine, made by metal, wood and paper, with dimensions: 3 cm x 26.2 cm x 10.5 cm. It has five metal wheels set flat into a wooden case with a metal top. Around the top edge of each wheel are placed ten short pins labeled clockwise from 0 to 9. Above each wheel is a round opening in the case. The edge of this opening is also labeled clockwise from 0 to 9. The tens-carry mechanism is implemented by means of slides (marked with G on the patent drawing), placed above the digital wheels. There is also a fixing mechanism provided, implemented by means of stop-bars (marked with Y) and springs (l). John Campbell took part in the Civil War from the very beginning, organizing an infantry regiment to fight for the Northern cause. Captain John Campbell was wounded and returned home in 1862. After the war he was appointed on several important public duties, like Assistant Provost Marshall, Treasurer of Parke County (2 terms), Assistant Assessor of Internal Revenue, Assistant of the Indiana Bureau of Statistics and Geology, County surveyor (10 years), etc. In 1870s Campbell opened a hotel, but failing to make a success of the enterprise went out of business. Campbell was so constituted mentally that he cannot learn anything until he becomes interested in it, but then only with great difficulty can he be prevented from learning it. He rummaged libraries, seeking every source of information and mastering the subject in a very short time. When the inventive fever was on, his most important business must stand aside until he solves the problem, whatever it may be, that has presented itself to his mind. John Campbell published various books and articles in the fields of statistics, geology, labor problems, finance, meteorology etc., and devised several other devices, e.g. a device for ascertaining the distance, methods of measuring the height of the clouds and others. In 1872 he published an interesting book—"The great problem of the age: An address on labor reform." He took out letters patents upon several inventions, e.g. Portable Fence (U.S. Patent 63853), Lifting-Tongs (U.S. Patent 130194), Revolving Cultivator (U.S. Patent 329137), etc. In 1870s he matured a road system in statutory form for creating, constructing, repairing and maintaining the public highways, on which he took out a copyright. John Campbell was married to Anna Bartha (Butterfield) Campbell (23 Jan. 1841-28 Nov. 1917), and they had one daughter, Lillian Jennie (Campbell) Bjorkman (1 Jan. 1869-25 Feb. 1903). The last few years of his life John Campbell spent in the Indiana State Soldiers' Home in Lafayette, Tippecanoe County, where he died on 30 April, 1911. He was buried in Rockville Cemetery, Parke County, Indiana.